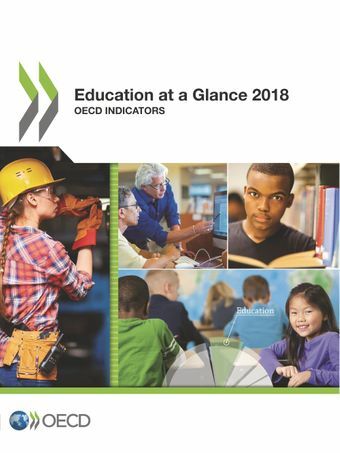 Education at a Glance: OECD Indicators is the authoritative source for information on the state of education around the world. It provides data on the structure, finances and performance of education systems in OECD and partner countries. With more than 100 charts and tables, Education at a Glance 2018 imparts key information on the output of educational institutions, the impact of learning across countries, and worldwide access, participation and progression in education. It also investigates the financial resources invested in education, as well as teachers, the learning environment and the organisation of schools. Indicator A1 To what level have adults studied? Indicator A2 Transition from education to work: Where are today's youth? Indicator A3 How does educational attainment affect participation in the labour market? Indicator A4 What are the earnings advantages from education? Indicator A5 What are the financial incentives to invest in education? Indicator A6 How are social outcomes related to education? Indicator A7 To What extent do adults participate equally in education and learning? Indicator B1 Who participates in education? Indicator B2 How do early childhood education systems differ around the world? Indicator B3 Who is expected to graduate from upper secondary education? Indicator B4 Who is expected to enter tertiary education? Indicator B5 Who is expected to graduate from tertiary education? Indicator B6 What is the profile of internationally mobile students? Indicator B7 How equitable are entry and graduation in tertiary education? Indicator C1 How much is spent per student on educational institutions? Indicator C2 What proportion of national wealth is spent on educational institutions? Indicator C3 How much public and private investment on educational institutions is there? Indicator C4 What is the total public spending on education? Indicator C5 How much do tertiary students pay and what public support do they receive? Indicator C6 On what resources and services is education funding spent? Indicator C7 Which factors influence teachers' salary cost? Indicator D1 How much time do students spend in the classroom? Indicator D2 What is the student-teacher ratio and how big are classes? Indicator D3 How much are teachers and school heads paid? Indicator D5 Who are the teachers? Indicator D6 Who makes key decisions in education systems? Education Indicators in Focus - No. 68: What characterises upper secondary vocational education and training?